The American-Canadian Tour (ACT) has announced the release of the 2016 ACT Late Model Tour schedule. The 13-event series will see the Tour visit 12 different tracks in six U.S. states and the province of Quebec as they pursue the $10,000-to-win ACT Championship. The season will once again kick off with the New Hampshire Governor’s Cup 150 at Lee USA Speedway on Sunday, April 10 and crown the 2016 champion at Connecticut’s Thompson Speedway on Saturday, October 15. Other traditional early-season events which have returned include the 18th Merchants Bank 150 at Barre, VT’s Thunder Road on May 1, the Spring Green 116 at Plattsburgh, NY’s Airborne Park Speedway on May 14, and a 100-lap event at Fair Haven, VT’s Devil’s Bowl Speedway on June 4. The 2016 schedule will again feature three ACT/Pro All Stars Series (PASS) doubleheaders. The two series open the Oxford Plains Speedway racing season on Sunday, April 17. ACT and PASS then travel to Quebec’s Autodrome Montmagny on Saturday, July 23. The 150-lap event is the ACT U.S. Tour’s first visit to the speedway since 1999 and is a combination event with Série ACT. The third ACT/PASS doubleheader is set for Saturday and Sunday, September 17 and 18 at Scarborough, ME’s Beech Ridge Motor Speedway. The ACT portion will mark the return of the Fall Foliage 200 to Beech Ridge, which previously hosted the event from 1987 to 1989. Beech Ridge will be the only track to host two ACT Tour events in 2016, with the Fall Foliage 200 being held in addition to their traditional early-August date. Autodrome Montmagny is one of three tracks the ACT Tour will return to in 2016 after a long hiatus. 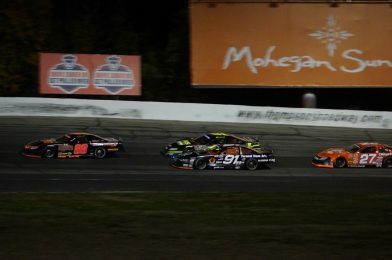 The Tour visits Connecticut’s New London-Waterford Speedbowl on May 21 and Massachusetts’ Seekonk Speedway on July 16 for the first times since 2010 and 2007, respectively, as part of the Southern New England Tripleheader. The three-race, three-track series concludes in the ACT season finale at Thompson as part of the World Series of Speedway Racing. Annual summer visits to N. Woodstock, NH’s White Mountain Motorsports Park and Groveton, NH’s Speedway 51 round out the schedule. For more information contact the ACT offices at 802.244.6963, [email protected]com, or visit www.acttour.com. April 9-10 — Lee USA Speedway — Lee, N.H.
April 30-May 1 — Thunder Road Speedbowl — Barre, Vt.
May 14 — Airborne Park Speedway — Plattsburgh, N.Y.
May 21 — New London-Waterford Speedbowl — Waterford, Conn.
June 4 — Devil’s Bowl Speedway — Fair Haven, Vt.
June 18 — White Mountain Motorsports Park — North Woodstock, N.H.
July 16 — Seekonk Speedway — Seekonk, Mass. Aug. 20 — Speedway 51 — Groveton, N.H.
Oct. 15 — Thompson Speedway Motorsports Park — Thompson, Conn.